Make a fabulous addition to your classroom decor with these beautifully detailed borders! 35' per pack. 2 3/4" W.
Chevron and chalk! What could be a more perfect combination? 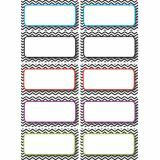 Add eye-catching flair to bulletin boards, doors, and common areas with this hot design! 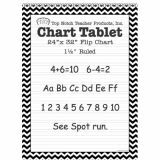 Traditional chart tablets featuring Brite colored high quality paper. Spiral bound and 2-hole punched. 25 sheets. 1 1⁄2" ruled. 24" x 32". 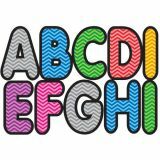 Use this fun design for name tags or dress up chubbies, books and more. 6 vibrant colors per pack. 3 1/2" x 2 1/2". 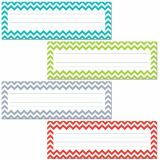 36 self-adhesive labels. 6 vibrant colors per pack. 9.5" x 3.25". 36 pieces. 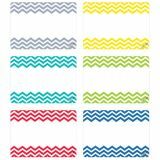 Use these Chevron storage bags to keep your books and other classroom materials protected and well organized, whether they're safely stored in your classroom or en route to or from students' homes. Use these sturdy bags to send books home with students and get them back in good condition. Each clear, plastic bag comes with a snap-shut white plastic handle. 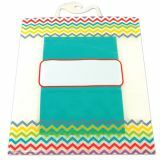 Plus, each bag features a colorful Chevron design on the front, and a place to write a student's name or to label the bag's contents. 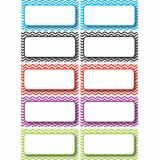 Bags measure 10½" x 12½"
Colorful write-on/wipe-off magnets punch out from an 8 1/2" x 11" sheet. 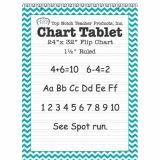 Use on magnetic whiteboards, steel lockers, filing cabinets and more! 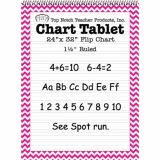 12 punch outs, 2"-3". Enjoy the stylish convenience of this all-in-one book. It provides space for lesson plans as well as records of attendance and grades for 40 weeks of school. 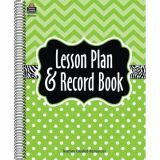 It also includes a student roster, a birthday chart, seating chart suggestions, and monthly planning calendars. 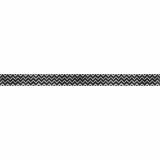 8 1‚Å-2" x 11". 160 pages. Spiral-bound.